Waterwoods Punggol Executive Condo (Executive Condo) coming soon in 3rd Quarter 2013 ! This is good news for Punggol residents who are looking to upgrade to an Executive Condo in 2013. The Housing & Development Board (HDB), who released the results for the Executive Condo site at Punggol Field Walk / Punggol East has awarded the tender bid to the highest bidder Sing Holdings Limited, at the tender price of $162.1 million on 10 Dec 2012. Waterwoods Punggol Executive Condo is within 3 mins walk to Coral Edge LRT and mins to the Punggol MRT and Bus Interchange. It is well connect via major expressways such as the TPE and KPE. Various amenities such as Food and Beverage outlets, Shopping malls and educational institutions are nearby as well. youngest towns has been indicated as the future of our country’s residential development. With development plans such as Punggol 21 Plus, there is no other place to be in than PUNGGOL! urbanisation amidst the quaint rural backdrop of places untouched by modernisation. Punggol 21 Plus is a development plan to offer a new vision and to revitalise Punggol New Town. 20-30-metre wideman-made waterway will run through the estate, linking both rivers. will be built on both banks of the waterway. Punggol Central will be converted into a tree-lined boulevard with landscaping. Promenade @ Punggol is only a short 5 minutes stroll from our Waterwoods Punggol Executive Condo . Residents can look forward to a host of recreational activities along the $16.7 million Punggol Promenade. The 5km promenade will link two activity clusters – Punggol Point and Punggol East. It is part of a 150km route that will allow residents to walk, cycle or jog around the whole island eventually. The Punggol Promenade is a long public waterfront promenade serving as a key pedestrian connector for the future Punggol Waterfront Town. Waterwoods Punggol Executive Condo is located within less then 10 min walk.Several renowned food-chains have commenced business operations within Promenade @ Punggol. POPEYES Restaurant, the famous fast food chain that originated from New Orleans, Louisiana provided Punggol Residents with an alternate taste of sensation. Uncle Leong Seafood has also set up another outlet in Promenade @ Punggol. Crab lovers swamp from all over the island to have a taste of their seafood delicacies. Frenzie Bistro is a favourite chill and relaxing café where diners can enjoy the river view as well as beers, liquors and western cuisine. Today, Poh Bros. has yet taken another leap in the local golf industry by bringing over another outstanding driving range to behold! Golfers @ Punggol!!! Golfers @ Punggol is conveniently located near Riviera LRT within Promenade @ Punggol. They are fully equipped with 80 bays within 2 levels, and facilities such as cafe, a golf simulator, a golf school, as well as, 2 pro-shops for your immediate golf needs. Singapore’s biggest Prawning Facility, Haibin has opened their 3rd outlet in Promenade @ Punggol. It provides yet another recreational activity that is very popular among Singaporeans today. Singapore’s favourite neighbourhood. It provides convenience to our everyday living. Our Waterwoods Punggol Executive Condo, for example, is less than 5 minutes’ walk away from Punggol Plaza. There is also the upcoming Waterway Point, which is one of Singapore’s biggest neighbourhood shopping mall and will be ready before the T.O.P . Punggol Plaza - Within 500m away,it make shopping for daily necessities and eateries just a stone throw away! Punggol and the northeast, but also attract visitors islandwide. entertainment concept by the waterfront. Popular Primary School such as Meetoh school is located just within 1km from our Ec site.This increase the chance of enrolling your kids in the most popular Primary school. 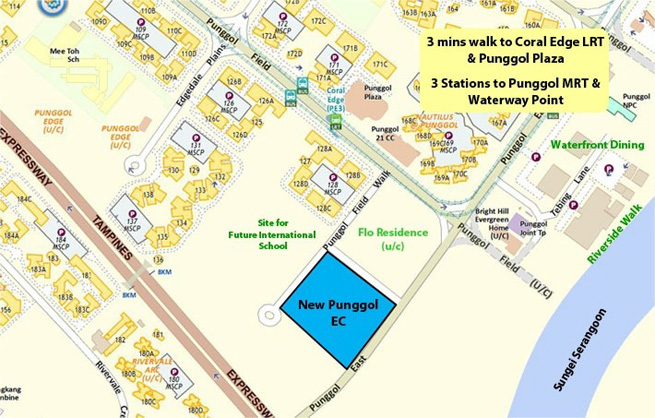 Coral Edge Lrt is located within 300 m away.3 stops away from Punggol mrt staion,travelling to town take less then 30 min! Executive CondominiumWhat are Executive Condominiums? Executive Condominiums (EC) were introduced to cater to Singaporeans, especially young graduates and professionals who can afford more than an HDB flat but find private property to be out of their reach. ECs are comparable in design and facilities to private condominiums as they are developed and sold by the private developers. Essentially, an EC has most, if not all, the facilities of most private condos. Who is eligible to buy an Executive Condominium? There are a number of criteria purchasers must meet. Some basic criteria is that applicants need to consist of at least one Singaporean. They must form a family nucleus, and their household incomes should not exceed S$12,000 per month. What incentive is there to purchase an EC? If both first-timer applicants are Singapore citizens they are eligible to receive up to $30,000 in CPF housing grant. If only one applicant is a Singapore citizen, they are eligible to receive half grant. What documentation do applicants need to bring with them to the Application process? Generally, the documents required would be their NRICs, marriage certificates, and latest income statements. What are the advantages of purchasing an EC? An Executive Condominium is very similar to a private condominium, where there are facilities for owners to enjoy, which are usually restricted to residents’ usage. In addition, other than purchasing it at a subsidized rate, purchasers of EC are able to apply and use the Housing Grant for the purchase of the EC unit, if they are eligible. What are the rules and regulations governing selling an EC? Owners would have to fulfil a MOP of five years. No transaction is permitted before this period is fulfilled. After five years, owners can sell their units to Singapore Citizen and/or Singapore Permanent Resident, and after 10 years they can sell to foreigners.